Welcome to the March installment of BL Bookrack! 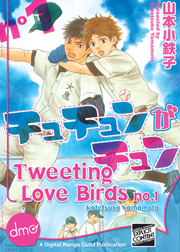 This month, Melinda and Michelle take a look at two debut volumes from the Digital Manga Guild, Tweeting Love Birds and You & Tonight. In Brief: About Love from Digital Manga Publishing’s Juné imprint, and volume one of My Darling Kitten Hair from JManga. Tweeting Love Birds, Vol. 1 (Kindle) | By Kotetsuko Yamamoto | Digital Manga Guild | Rated YA (16+) – Thanks to a back cover summary that made one of the characters sound intensely annoying, I wasn’t expecting much from Tweeting Love Birds. I ended up being pleasantly surprised, but that’s not to say that the book is riveting or unique. Daisuki Ohtaka started playing baseball because his grandfather was a fan, and even goes so far as to enroll in his grandpa’s alma mater. He doesn’t seem to have much personal love of the game, however, and once he arrives and discovers the shabby state of the team, he immediately wants to leave. After the small and cute captain, Suzume Morino (aka “Tweetie,” a nickname derived from the fact that his name means “sparrow”), blackmails Daisuke (whom he promptly christens “Taka”) into staying, he finds himself becoming more intrigued by Tweetie and experiencing jealousy when others give him attention, even while maintaining that he is straight. Yes, this might be another “only gay for you” story, but so far it’s kind of charming. It has a slice-of-life feel that I appreciate, with any baseball action firmly in the background, and sometimes it’s even funny. I snickered out loud, for example, when a drunk Tweetie proclaims, “Taka touched my boobies.” There’s nothing much original about the plot or its execution, but neither is there anything glaringly offensive. The adaptation by DMG group Boys’ Love Bang Bang is also flawless, with no errors or awkwardness to detract from one’s reading experience. I’m a little surprised that Yamamoto-sensei was able to squeeze enough material out of this setup for a second volume, but there is indeed one more installment to go before the series is complete. Despite first impressions, I’ll be coming back for more. You and Tonight, Vol. 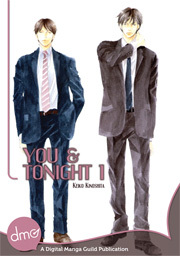 1 (Kindle) | By Keiko Kinoshita | Digital Manga Guild | Rated YA (16+) – Rikuro has spent ten long years hiding his feelings for his straight best friend, Yasutaka, only to discover that Yasutaka gave in and slept with a male coworker after he begged and cried. Though the news gives him sudden hope, it also makes him begin to panic that his time is running out. But can his friendship with Yasutaka really survive the truth? I’ve developed a bit of a love affair with Keiko Kinoshita’s work as of late, and this series has only deepened my feelings. Written in the same vein as her earlier two-volume series Kiss Blue, You and Tonight is a thoughtful, quiet manga about the delicate balance between love and friendship, and how two lifelong friends deal with the complications that arise when that balance is disturbed. Also like Kiss Blue, You and Tonight lets its characters process this sloooowly, which is one of the things that makes Kinoshita’s romance work so well. She isn’t afraid to let her characters wallow in uncertainty, and she certainly takes her time, but there’s never a sense that the story is dragging. On the contrary, there is tension in each moment, even the quietest ones. Kinoshita’s artwork has always been on the understated side, but her expressiveness really shines here in this volume. She makes the most of her characters’ body language and subtle facial cues, working as much emotion into them as she does into her equally understated dialogue. Both Rikuro and Yasutaka process most everything on the inside, making their moments of visible weakness even more powerful. A single panel of Rikuro breaking down, alone in an elevator, springs immediately to mind. It’s an image that’s stuck with me for days after reading this volume. Digital Manga Guild localizing group Cynical Pink does a lovely job, too, providing a clean, lyrical adaptation that suits Kinoshita’s tone perfectly. For fans of Keiko Kinoshita, this series is a must-read. For everyone else… it’s a must-read too. Highly recommended. Some review copies provided by the publishers.